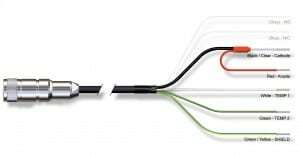 What makes OxyProbe® sensors unique? 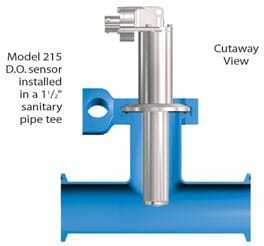 This 19mm Dissolved Oxygen Sensor is for use in Novaseptic installations and in 1.5″ sanitary tees. 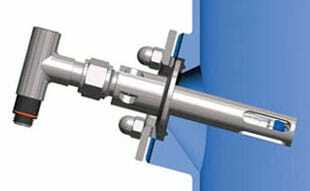 It is important to note, these sensors are not intended for use with the standard 25 mm sanitary flange ports. However, they can be used with the NovAseptic ports. The interior design and replacement parts of this sensor are the same as other 25 mm OxyProbes. The modular design allows quick replacement of any part, making it easy to maintain and repair the sensor. OxyProbe dissolved oxygen sensors carry a 1-year warranty. This sensor is also available with straight connector as D210. Fits in both sanitary flange ports and NovAseptic ports. Can also be used in-line in a sanitary pipe tee. It is important to maintain the sensors by inspecting and calibrating them regularly. The membrane cartridge should be checked and refilled prior to every use. Determine how far the sensor should project into the vessel. Decide whether a right angle connector is preferred over a straight connector. Choose the correct cable length and connector. All DO sensors require cable and connector assemblies. It is important to regularly maintain the sensors by inspecting and calibrating them. 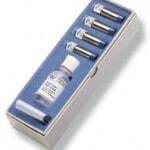 The membrane cartridge should be checked and refilled prior to every use. Part No. 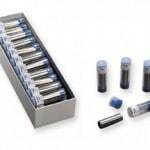 KC2525 25 membrane cartridges in one easy-to-store box.Internal o-rings, gaskets and electrolyte must be ordered separately. The Models D210 Series D.O. OxyProbe sensors are intended for use in a 1 1/2” sanitary pipe tee. The sensor is secured into the tee with a standard flange clamp sealed with a flange gasket. The tip of the sensor is positioned in the middle of the process flow when it is placed in a standard size tee. These sensors can also be used in NovAseptic ports. The Model D210 or D215 sensor installed in a NA-connect® port offers potential benefits in biotech applications. 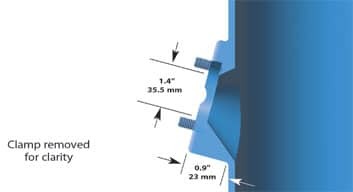 The unique design of the port offers increased drainage around the port and most effective Clean-In-Place (CIP). This port, which is almost flush to the vessel wall, allows the use of a 19 mm sensor front end, since there is no need for a forward o-ring to seal the sensor into the vessel. Minimizing or eliminating the cracks or crevices improves clean-ability. Sometimes found on vessels in biotech facilities, this style of port is flush to the vessel wall to minimize crevices. The unique design of the port offers increased drainage around the port and more effective Clean-In-Place (CIP). 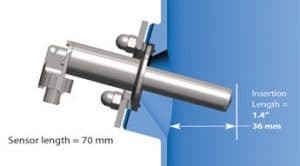 The NA-connect® port from NovAseptic is compatible with a special sanitary housing, which is secured to the port by a clamp. The port is installed at a 15° angle to allow for proper electrode performance. See the cutaway drawing to the right for typical installation dimensions. 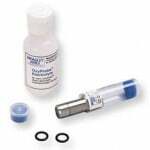 The internal seals of an Oxyprobe are all mechanical seals using o-rings. There are no adhesives to leak or fail in process, making this a more rugged and reliable sensor. Replacing the cathode is also much easier and faster since there is no sealant to clean from the threads. No sealant also makes the job of replacing the cathode much faster and cleaner.